Small/Medium - $79.99 Only 2 left! We'll be the first ones to admit that Peter Cottontail is the sole reason why Easter is so much fun. The Easter baskets, outdoor egg hunts, and delicious chocolate bunnies are all reasons why the cherished holiday is loved by many, young and old, and we have Mr. Cottontail to thank for that. Pay your respects to the furry face of Easter by dressing up like him. You can choose to wear this costume during the spring-time holiday or you can randomly wear it throughout the year, either way you'll have a tail-wiggling good time whenever your dressed up as the Easter Bunny! 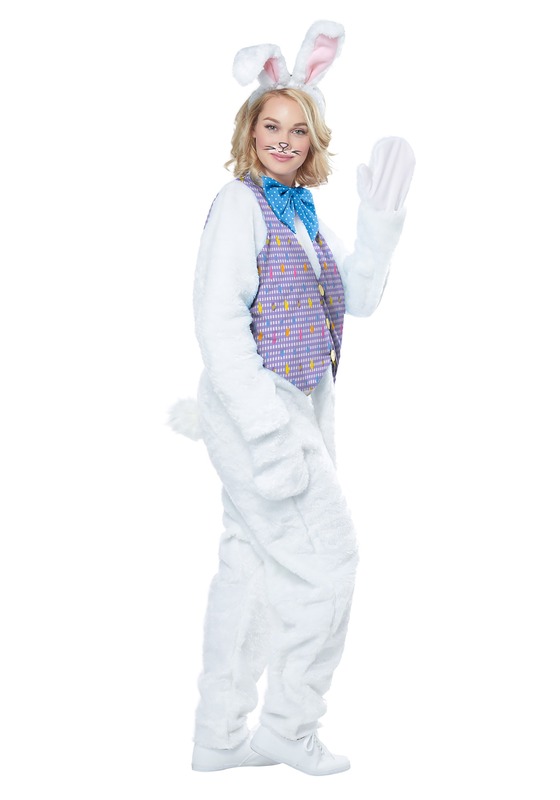 This adult Easter Bunny costume comes with everything you need in order to personify the best-dressed bunny to have ever lived. The furry jumpsuit features an attached purple gingham print vest with faux buttons. Use the included polka dot bow tie to complete the stylish look because Peter Cottontail bust look as dapper as possible at all times. The soft jumpsuit has a Velcro enclosures in back so the costume can easily can on and off. The plush headpiece exposes your face while the included nose piece goes around your hand with an elastic band. Now you have a little pink nose just like a bunny. Finally, there's the comfortable hand covers that have elastic cuffs so they'll easily stretch over your hands without feeling too snug. It's the perfect accessory to wear while filling baskets with jelly beans and decorating the front lawn with colorful eggs. So hurry up and hop to it! 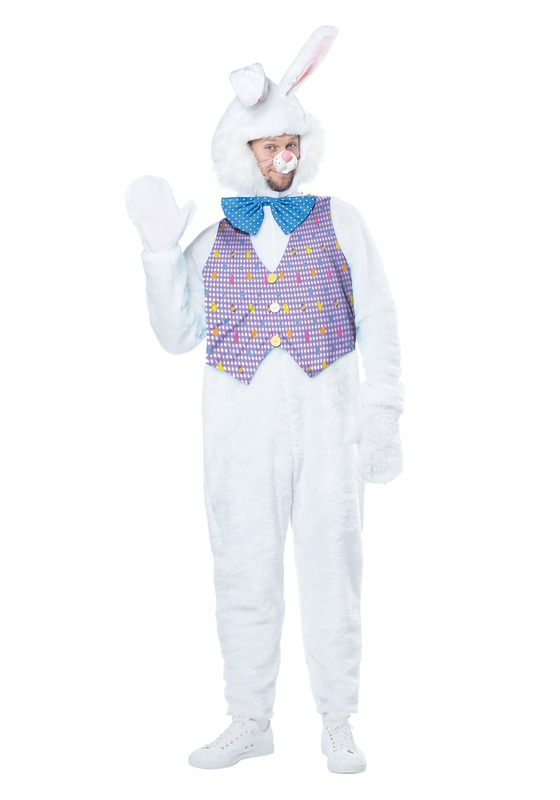 You need to wear this costume ASAP so all the Easter festivities can start because we're really starting to crave a Cadbury Creme Egg!